Zambia with its capital Lusaka is located in Africa (Southern Africa, east of Angola). It covers some 752,619 square kilometers (almost five times the size of Georgia) with a population of 15,972,000. English and Nyanja are some of the languages spoken by the majority in Zambia. Angola, Democratic Republic of the Congo, Malawi, Mozambique, Namibia, Tanzania and Zimbabwe are bordering countries. Zambia is a state in Southern Africa. Roughly the size of Texas or France, Zambia is a landlocked country, bordered by Tanzania to the northeast, Malawi to the east, Mozambique to the southeast, Zimbabwe and Botswana to the south, a narrow strip of Namibia known as the Caprivi Strip to the southwest, Angola to the west, and the Democratic Republic of the Congo to the northwest. Zambia offers travelers some of the world's best safari opportunities, a glimpse into real Africa, and Victoria Falls, one of the World's Seven Natural Wonders and a UNESCO World Heritage Site. A highlight of any trip to Zambia is a visit to any of the many traditional festivals held throughout the country. Planning ahead can be tough though, as schedules are variable and not all are held yearly. To reach someone Zambia dial +260 prior to a number. The local cellular networks are operated on 900 MHz, 3G, 4G. Websites typically end with the top level domain ".zm". If you want to bring electric appliances (e.g. battery chaarger), keep in min the local 230 V - 50 Hz (plugs: C, D, G). The sign for the locally used currency Kwacha is ZMK. 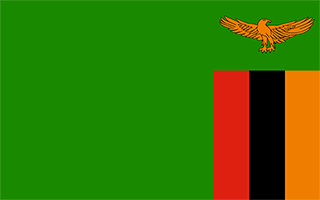 Green field with a panel of three vertical bands of red (hoist side), black, and orange below a soaring orange eagle, on the outer edge of the flag; green stands for the country's natural resources and vegetation, red symbolizes the struggle for freedom, black the people of Zambia, and orange the country's mineral wealth; the eagle represents the people's ability to rise above the nation's problems.